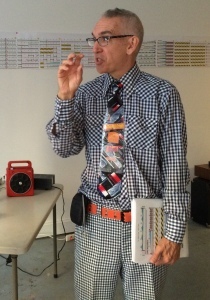 Gen Ken Montgomery is a New York-based artist whose involvement in the cassette-culture and mail-art movements of the late seventies led to the creation of Generator, New York’s first sound art gallery (1989). At Generator Montgomery amassed what is now a time capsule of internationally produced art in the form of cassettes, records, zines and ephemera from the days before the internet when artists collaborated and corresponded by post. In 2013 at Audio Visual Arts in New York City, Montgomery exhibited his collection from that era and re-created Generator by curating events with artists whose work was shown at Generator in the late 80s and early 90s. Generator will re-emerge as a popup in the ALLGOLD Printshop at PS1/MOMA from December 6 – December 21. Montgomery will curate concerts, installations and screenings of work by sound artists each weekend. Additionally, the Generations Unlimited label he started in 1987 with David Prescott and Conrad Schnitlzer will re-launch. For the past 30 years he has used sound as the primary source material in his artwork and performances and has collaborated with many legends of the music/sound noise underground including G. X. Jupitter Larson, Scott Konzelmann (CHOP SHOP), David Lee Myers (Arcane Device), Al Margolis (If, Bwana), and Berlin composer Conrad Schnitzler. Montgomery has presented his sound work in Europe, Canada and the U.S. In New York his sound work has been heard at MOMA, The Whitney Museum, P.S. 1, AVA, The Stone, The Kitchen, White Columns, Experimental Intermedia, Issue Project Room, and many others. In May 2013 a retrospective of Montgomery’s immersive multi-channel concerts was presented at Harvestwork in New York City. Comments closed — Trackbacks closed RSS 2.0 feed for these comments This entry (permalink) was posted on Friday, November 14, 2014, at 12:03 pm by Dan Joseph. Filed in press release.